The Blackbird was the only aircraft ever to be designed around the J-58 (JT-11). 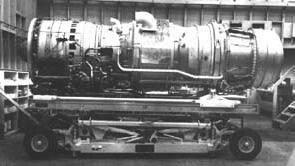 This turbojet engine had been developed for a USN project, by Pratt & Whitney, at their West Palm Beach R & D center in Florida. Eventhough its existence remained a secret until revealed on 28th February 1964 by US President Lyndon B. Johnson, that of the JT-11 engine was already known to specialists. 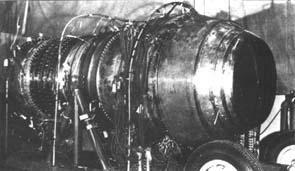 The very first Mach-3 jet engine, designed by Pratt & Whitney for the North-American XB-70, was the J-91 (aka JT-9). In spite of a hazy future for that six-engined bomber, the design studies for the propulsion units proved fruitful when a somewhat smaller but also Mach-3 engine had to be designed for the US Navy, named JT-11 and known later as J-58. 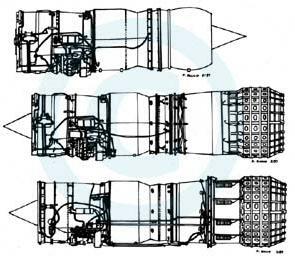 The initial design-studies for this turbojet were launched in 1956. At the outbreak the project was company-funded, but soon the U.S. Navy, which was developing a Mach 3 strike aircraft, started sponsoring its development. The U.S. Navy requirement called for an engine with sufficient thrust for sustained flight in the environs of Mach 2.5, however able to reach short-burst peak speeds exceeding Mach 3. Initially it was to be fitted on an upgraded version of the North American A3J-1, from which the RA-5C "Vigilante" would later emerge. As part of this program, two projects by Vought designated V-418 and V-419 also came into being, better known under their generic designation of F-8U-3 "Crusader III". The first was fitted with a J-75, the second received a J-58. The engine would implement the ramjet principle to supplement the low compression rate from the axial compressor. It was designed to supply 26,000 lbs (11,800 kg) of thrust, with afterburning, at sea-level. The first official aid, amounting to $ 11.2 million (55 M Francs) was received in August 1959, with an order for 30 prototypes. In the meantime, the YJ-58 was undergoing ground running trials (in 1957). The 50 hours running acceptance trials were completed in August 1958, thus evidencing the fast pace at which the development of the new engine progressed. Alas, due to sky-rocketing costs, the US Navy eventually dropped the project. Only the Vought V-418 project succeeded in bringing forth the two XF-8U-3 prototypes, but once again this project was abandoned after the roll-out of the first F-8U-3, the pre-series of the McDonnell Douglas F-4H-1 "Phantom II". Over that period, trials were successfully performed in the specialized facilities at Wilgoos. On their test benches, flight conditions of Mach 3.2 up to 30,000 meters (100,000 ft) could be simulated. The wind tunnel was capable of supplying air at high-pressure (2 at.) with a flow-rate of 750 lbs/sec. (340 kg/sec.). Pratt & Whitney contemplated two possible developments of their "super jet"; a military version capable of powering an aircraft at stratospheric altitudes at Mach 3 speeds and a civil version, capable of great thrust (to the order of 20 tons) over an extended flight duration - presented in typical 50's jargon as "all supersonic". Parallel to all this, Pratt & Whitney successfully accomplished trials of their model 304 liquid-hydrogen turbojet-engine which, although it had been officially rejected, was successfully tested in October 1958. The final duration run on the test bench at West Palm Beach lasted 25 hours 30 minute. As regretful as it may be, the 304 turbojet remained only a prototype and the 'Suntan' project, for which it was intended, was closed at the end of 1958 with a bill reaching 250 million dollars. Furthermore, since the General Electric J-93 had officially been selected on 6th November 1957 for the B-70, the development budget for the J-91 was cancelled. By then Lockheed had commenced working in the greatest possible secrecy on a series of high-performance aircraft projects aimed at replacing the U2, numbered from A-1 through A-12. Numerous engine installations were envisaged, among which some featuring the high-thrust Pratt & Whitney J-58, which had only recently completed 700 running hours. Thanks to the influence of Kelly Johnson and Pratt & Whitney's chief-engineer William H. Brown, Lockheed obtained an advance order on 29th August 1959 for their project designated A-12, fitted with two J-58s, and allocated a development budget of $ 600 million. The program, maliciously entitled 'Oxcart', was officially approved on 30th January, 1960, and included the manufacturing of twelve aircraft for the CIA. At that time, Pratt & Whitney had one of the most powerful industrial computers at their disposal, an IBM-710. Its calculation capacities were at best equal to that of some pocket calculators of the 1980's. So with all things considered, the J-58 globally still was another offspring of the good old slide-rule. Despite all the performance graphs and bench runs most of power-unit integration problems would only be resolved by flight trials. The Lockheed - Pratt & Whitney duet enjoyed much from the understanding of government officials in charge of that specific file. They let the companies deal with problems in their own way, and refrained too much from interfering in the course of the development phase of modifications which might have operational or major budgetary aftermaths. It is a consequence of this fast reaction to encountered technical difficulties, that project progress was accelerated and this was recouped in substantial financial savings. When project Oxcart was born, various codenames were employed for each sub-assembly of the propulsion units. So, the forward bypass was baptized 'onion slicer', whereas the aft one was named 'cabbage slicer' whilst the trailing edge flaps were given the most classic term 'tail feathers'. But soon the codenames were dropped, an instruction soon being passed around informing that standard terms should be used. Pratt & Whitney 304-hydrogen engine prototype planned to equip the project Lockheed "Suntan". One of the first version of the J-58 without after burner as it appeared in the sixties in Pratt & Whitney advertisements. It is probably a YJ-58. This full-scale model of a J-58-P2 was made by Pratt & Whitney in Hartford in July 1961 to study the global size of the engine. The J-58 was later equipped with an after burner. This model was usually presented as a J-58-P2 destined to equip the F8U-3 and A3J of the US Navy.